So you’ve purchased a new competency dictionary or developed a new competency model and think you’re ready to implement them in your organization. By jumping right in, you may have missed a critical step in the development process that could open you to legal challenges and a lack of employee buy in. Validation is this critical step, but how much is too much, or not enough? 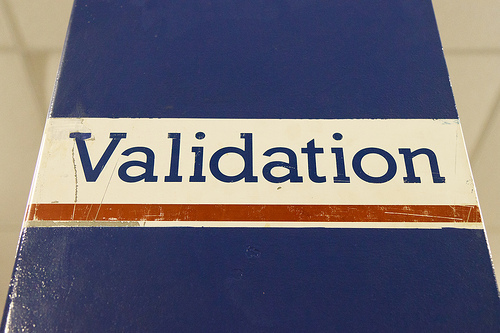 In the simplest terms, validation is the process of verifying your competency model. It involves checking your model to ensure that it adequately reflects the knowledge, skills and abilities that your employees must demonstrate in your organization. Just as a good journalist must check their sources with at least one other individual to ensure that the information they receive from a source is correct, an organization implementing competencies should always verify their information. Questionnaires: Questionnaires can be paper-based or distributed using online questionnaire systems. They can also be quite complex (e.g., every employee in a large organization, multiple job families, validating sets of competency profiles) or quite simple (e.g., obtaining feedback on one competency, selecting organizational core competencies). Focus Groups: Inviting groups of employees to come together and provide feedback on competencies or a competency model. Expert Panel Review: Bring together a representative sample of individuals for a particular job or groups of jobs to provide feedback for all job incumbents. The validation method(s) you use depend on a number of factors such as how many employees are involved or impacted, the amount of information you need to collect, and your budget. Depending on how you are planning on using your competencies, they must be defensible. If you are using competencies for performance planning or selection, it is critical that you are able to show that you have done your due diligence in ensuring that the competencies accurately reflect the required on-the-job behaviours of your employees. If not, your organization opens itself up to any number of legal challenges. At the very least, the consequence of not validating and getting your competencies wrong can result in a lack of employee buy-in or all-out rejection of the competency initiative. The validation process can also be used to help you accomplish your communications plan activities. You can use validation as a way to provide your employees more information about the steps in the implementation process, how they will be involved and what the outcome of the implementation process will be. Have you received feedback from a variety of points of view? Are your validators representative of all employees? Do those involve in the validation truly understand what it takes to be successful in the job? Do the competencies reflect the requirements for truly effective performance on the job? Do employees leave your validation sessions confused? Do you continue to receive many questions or complicated feedback? Are employees already rejecting the competency model? In the next post later this week, we will examine each of these questions in detail to help you to determine whether you have sufficiently validated your model.